Have you ever wanted a plateau on your terrain that a building can stand on or to cut a flat road through a scene? Here is a new Python script for Vue 6 Infinite and Vue 6 xStream to make doing both of those easier. It appeared as a work in progress yesterday (Terrain Sculpting Python Script WIP. I’ve chopped a couple of options out of it that were slowing it down. If I can think of a quicker way of getting the code to work I’ll add them back in later versions. 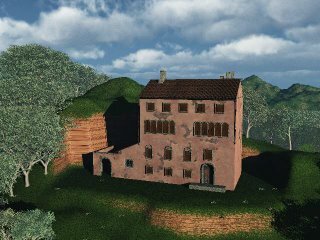 The picture above is a quick test render of a standard mountain terrain that I used the script to cut a flat area for the house to stand on. You can download the script from the impworks’ Terrain Matcher vue python script page. Thanks for this. I don't understand the questions though ... what does "how far should the match spread beyond the match to objects" mean?